"I love it! Finally I can see what file I need to open without opening Lightroom or Bibble first." The Nikon RAW (NEF and NRW) Codec is a plug-in for Windows Explorer, Windows 7 Media Center, Windows Photo Viewer, and Windows Live Photo Gallery. 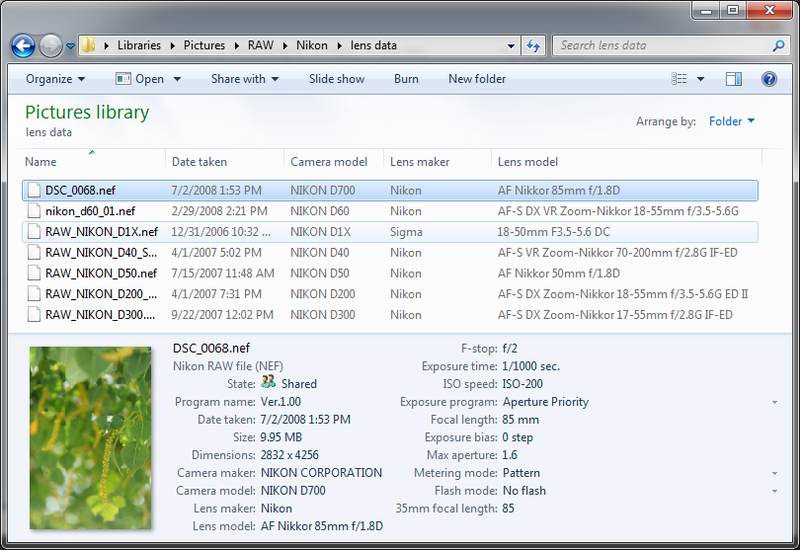 View NEF files thoughout Windows, including NEF files from Nikon film scanners. The NEF codec supports the latest Nikon camera models, including the Df, D800E, D610, D7100, D5300, and D5200. View NEF files instantly in Windows Explorer, Windows Photo Viewer, Windows 7 Media Center, and Windows Live Photo Gallery. Search and view metadata, including broad support for lens data. See date taken, exposure information, and other details in Windows Explorer on Windows Vista, Windows 7, and Windows 8. View thumbnails of NEF files in Explorer without having to start an application. Instantly browse through hundreds or thousands of images using our fast thumbnail support. If the codec Preferences are set to use the embedded JPEG image for fast viewing instead of using RAW processing, the width and height displayed will be that of the embedded preview image. The registration code is used to unlock the trial version. When you purchase a license the registration information can be entered in the Preferences application in the NEF Codec by Ardfry Imaging program group. The registration code is printed on the receipt page when then transaction is completed and in the order confirmation email. Processes RAW data for many models, and uses embedded JPEG preview for all others. By default, the embedded JPEG is used.